SOA, RIA, and Ajax are the backbone behind the now widerspread Web 2.0 applications such as MySpace, GoogleMaps, and Wikipedia. Although these robust tools make next generation web applications possible, they also add new security concerns to the field of web application security. 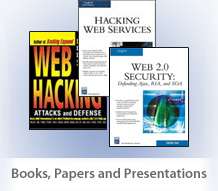 Great exposure for security professionals, developers and administrators about Web services security issues, methodologies and defense strategies. Exposes complete methodologies showing the actual techniques and attacks. Shows countermeasures, tools, and eye-opening case studies.